Norwich City FC Head Groundsman Gary Kemp has recently doubled his fleet of Dennis G860 cassette cylinder mowers for use on the stadium pitch at Carrow Road and also the nearby Colney Training Centre to four. Scottish Premiership football club Hibernian have become the latest top flight club to purchase a new Dennis G860 34â€ professional mower with a range of interchangeable cassettes for use at their Easter Road Stadium. Sports Turf Services (STS), one of Scotland's leading sports and amenity turf maintenance contractors has chosen Dennis as a key supplier of maintenance equipment. 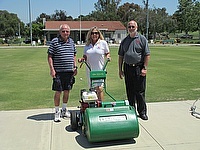 The contractor has recently purchased a range of Dennis FT510 interchangeable cassette mowers and Verticut TT machines. Managing Director Peter Campbell, who purchased the company in 2007, explained that they have used Dennis at cricket, bowls and golf clubs across Scotland for over twenty years. Having recently returned to Chelsea FC as the first team manager, all eyes have been on Chelsea and Jose Mourinho since the new Premier League season began in August. To keep Stamford Bridge in perfect playing condition, the stadium's assistant head groundsman, Kevin Fowler, knew just what the club needed - a Dennis G860 professional mower complete with a range of interchangeable cassettes. Continuing its programme of working closely with end users, Dennis and SISIS have concluded their 2013 series of educational events with the recent bowling green maintenance seminars at Currie Bowling Club, near Edinburgh and Cardonald Bowling Club in Glasgow. 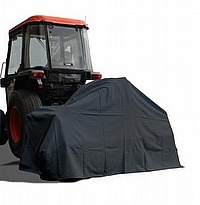 Dennis will be back at IOG SALTEX in 2013 on stand B40 showing a prototype tractor mounted cutting unit, designed specifically for cutting golf fairways, cricket outfields, football pitches and large ornamental areas. 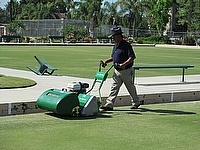 The next round of the Dennis and SISIS bowling green maintenance seminars has been announced, with the company heading to Currie Bowling Club, Near Edinburgh on 1st October before moving on to Cardonald Bowling Club in Glasgow on 2nd October. Npower Championship football club, Leeds United, has purchased two Dennis G860 34â€ professional cylinder mowers, complete with a range of interchangeable cassettes, to help maintain the Elland Road pitch. Alan Ferguson, Head Groundsman at St George's Park - the FA's National Football Centre, has chosen Dennis as a key supplier of maintenance equipment for use on the natural elite pitches. The award winning groundsman purchased three Dennis G860's complete with interchangeable cassettes, meaning that his groundstaff can complete a multitude of tasks. Three Dennis Premier models complete the line-up of pedestrian mowers that Alan and his team will use to keep the 330 acre park in pristine condition. Dennis and SISIS have concluded their spring 2013 series of educational events with the recent bowls seminar at Meole Brace Bowling Club in Shrewsbury. 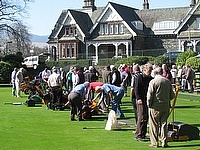 Committed to educating greenkeepers on how to maintain and look after bowling greens, the British manufacturer was pleased with the event which saw over 50 people attend the day which encompassed a mix of technical presentations and demonstrations 'on the green'. 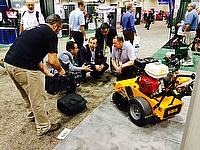 Dennis and SISIS, divisions of the Howardson Group, a leading British manufacturer of innovative world class turf maintenance equipment, has announced a new strategic partnership with Fusion Media (Europe) Limited that will include working together on a variety of PR and digital media projects for both brands. Dennis and SISIS not out for 100! Dennis & SISIS scored a well-earned '6' with over 150 delegates attending their recent Seminar at The Brightonandhovejobs.com County Ground. The programme for the day was kicked off by the company's Area Sales Manager, Robert Jack, who welcomed delegates and thanked the event's sponsors for their additional support.